even more from the show! 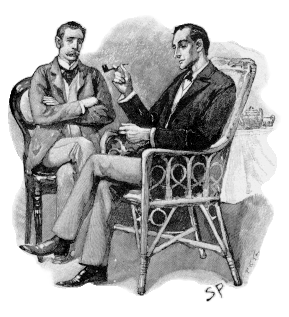 i know that i've mentioned several times in this venerable blog that i've recently been cast in a production of sherlock holmes and, though i'm not quite sure that i mentioned this, AS sherlock holmes. it's quite and honor and i'm very excited about it...but, damn! that guy's got a lot of lines!!! "Rather a rash project of yours, Moriarity--even if you have made the streets secure in every respect--to think of using that gun--so early in the evening and in this part of town. I am afraid that in the pleasure of this conversation I am neglecting business which requires my presence elsewhere." "You're an idiot, Moriarity. I gotta go." well, maybe not that much, but you know what i mean. 2. which color kryptonite made superman turn into a girl? i made it up. never happened. (as far as i know...) although, by definition of it's erratic and unpredictible properties, red krytonite could do it. 3. in the soup nazi episode of seinfeld, another of the storylines involved jerry being uncharacteristically affectionate with that week's girlfriend, driving george crazy. what was the pet name jerry and his girlfriend had for one another...? 4. jessica alba's characters name on dark angel? 5. which richard bachman book features a contest in which 100 adolescent boys compete in an interstate marathon? You ARE Sherlock Holmes. That's awesome. I'm curious to see how you portray him. Are you playing him as a coke-fiend, like he was originally written? He never solved cases high. He just did it when he had nothing to do. Otherwise his mind would race too much. But it seems to me using coke would only make that problem worse. As for the dialog, I doubt how authentic it was. I know Dickens was paid per word. And considering Doyle published in magazines also, I imagine he had a similar deal. So, more dialog equals more money. And too much editing equals the poor house. I was wondering what your role was and now that I know it is the man himself, I really feel bad that Dad's big 80th birthday bash will keep me away from opening night. As for the Kryptonite question, Holmes, you may be even smarter than you think as Pink Kryptonite comes very close to being a good answer. According to Wikipedia, Peter David used Pink Kryptonite in a 2003 Supergirl alternet timeline story to turn heterosexual Kryptonians temporarily into homosexuals. It was reportedly seen in just one panel with Superman giving flattering compliments to Jimmy Olsen about his wardrobe and decorative sense. Oh that kooky Peter David. I can't remember anything, let alone lines from the victorian era. Good luck Todd! Hello all, how is everybody?